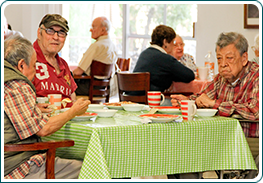 Is a non-profit organization which was founded in 1956, as “Asilo de Ancianos Luis Elizondo” providing assisted living to the elderly in poor economic situations. This retirement home was the most preferred charity work done by it’s founder, Luis Elizondo Lozano, the late philanthropist born and raised in Monterrey, Mexico. Being at least 65 years of age. Taking care of yourself without assistance. Willing to be part of our community. Have two responsible adults on file. Alzheimer patients and any type of senile dementia (up to the 4th degree). Elders with arm or leg amputations.